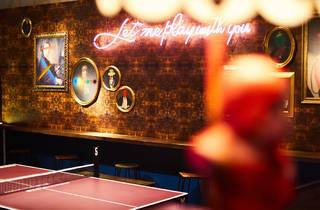 A bar and restaurant in Farringdon where you can eat, drink and play ping pong. 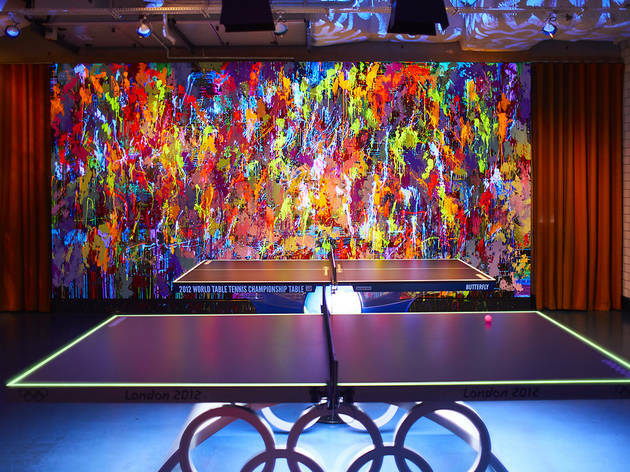 This is the original ping pong bar that Bounce opened and it's located, allegedly, on the exact spot that the beautiful, bouncy game was invented. 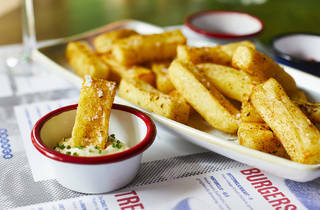 Along with a satisfying selection of pizzas (straight from the wood-burning oven), canapé packages and suave cocktails, Bounce serves up a night of competitive fun in an edgy industrial-chic space. The restaurant is raised on a platform overlooking the ping pong drama unfolding on the 17 tables below, so you don't have to worry about wayward balls when you're not in the throes of a game. Bounce's 12,000-square foot venue has become the benchmark for social group fun. 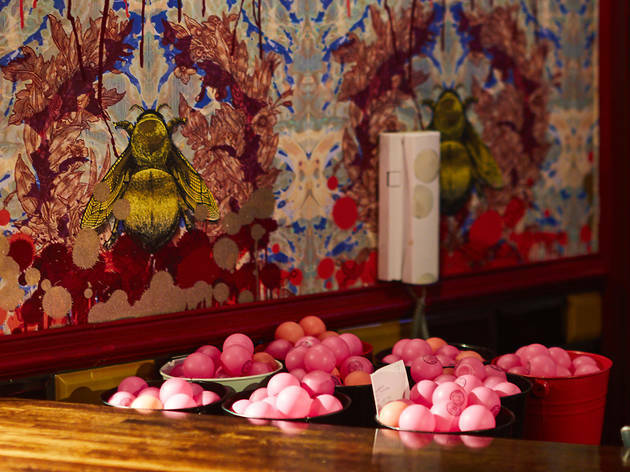 With 17 bespoke designed ping pong tables, a restaurant and cocktail bar combined in a beautifully striking space by award winning interior designer Russell Sage. 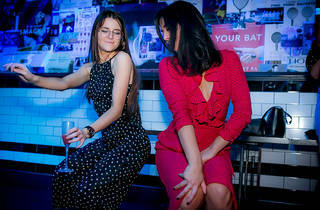 Bounce has established itself as one of the most iconic venues in London and one of the most fun! We play host to top DJs including Mighty Atom, Ryan Russ, and Bex & Belle, playing classic disco, funk, soul, golden era hip hop and R&B... as well as classic pop moments from the 80’s, 90’s and 2000’s. Bounce has just launched a new concept called Wonderball. 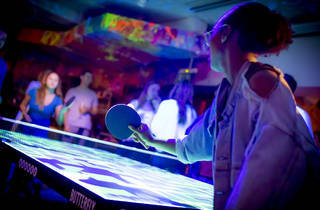 It's not Ping Pong, but it is a completely new immersive activity. Using state of the art projection mapping, each Wonderball table becomes a giant computer game, introducing a whole new way for groups to play - with very little skill needed. I guess I was fairly surprised about this place. When i heard it had opened a couple of years ago, i dismissed it as another fad bar. And since that time i had been avoiding Bounce. To my own detriment it seems. After reluctantly agreeing to go with a friend who assured me it was 'amazing', three of us popped in for friday night drinks. And blow me dead, wow. Absolutely loved the place. What an amazing atmosphere!! Unfortunately we were a little late to get a ping pong table but there did seem to be a table that anyone could join in and play on anyway! We stayed from 7.30 until it closed and yes, i will be going back again. I really love Bounce, have celebrated my birthday there for the last two years & plan to again next year. 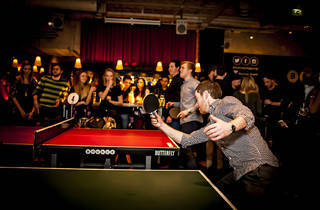 I recently chose Bounce as a venue for a second date; drinks & a game of ping pong worked well. Always a lively atmosphere with really friendly & helpful staff. 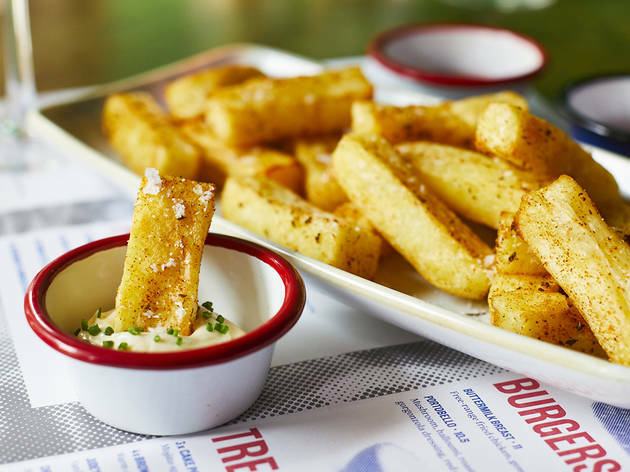 There is a decent selection of bar food & the restaurant is pleasant with great pizzas. Bounce ticks so many boxes; a fun night out with friends or a work outing as well as great for a smaller crowd like a date night! Been there twice with my daughter while visiting her and found Bounce to be a friendly, clean and relaxing establishment to eat in. The food has always been amazing and served to the table with a smile. A great relaxed atmosphere with a good choice of music. I went there with friends on a Saturday night, possibly one of the busiest nights there. Despite it being busy, the staff were still friendly and helpful and even managed to get us another ping pong table after our reserved one! Such a fun concept, my friends and I had a blast here over the weekend! I liked how there was a good selection of drinks, especially the gin, which is my favourite and made for some unique G&Ts. I also liked how there were plenty of seats to sit and have a drink and food while waiting for your turn on the tables. The time really does go by quickly but it's so much fun and I liked how some tables had projected screens to light it up. It was nice having our drinks brought to us while we played and having the ping pong balls constantly topped up in our bucket - saves on us having to run around catching our lost ones! I will definitely be back and it's such a great idea for a party or event. If you want a great night out with friends then this is the place to be! 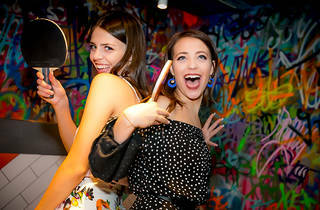 Bounce have delicious woodfired pizzas, great music and of course the best bit is you get to play ping pong! We had a brilliant fun time and will definitely be planning another night here soon! Attended a private function here in one of their separate rooms. 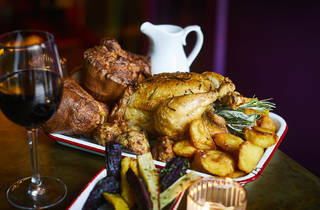 The food and drinks were amazing and the staff were very good at making sure everyone was having a good time. I had never actually played ping pong before so was a little anxious but I got into the fun of it (albeit with very limited skill) and had a good time. 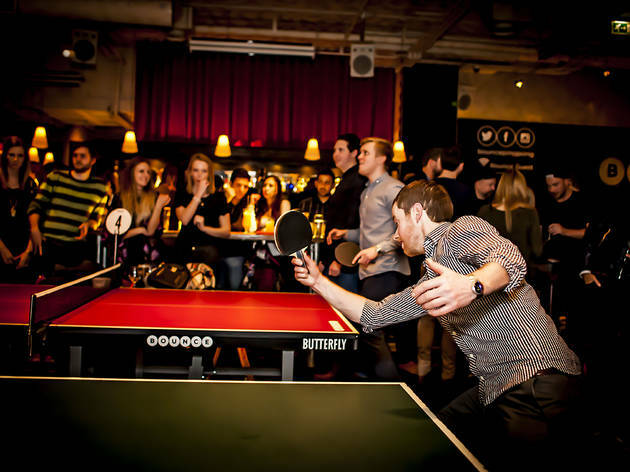 An awesome idea for a night out.. drinks, food and ping pong!! This place is even cooler than it sounds. The resident DJ is fantastic, playing some great tunes, and the neon lighting is great. The food is basic but tasty - the pizzas are really yummy. A good cocktail list accompanies all the usual beers and wine. Ultimately though, the best thing of course is the ping pong! Lots of tables so you shouldn't struggle to play. Its a big place and the atmosphere is fab. 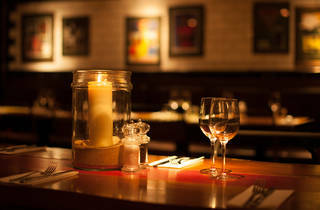 Great venue for a night out with friends or a team social. I went for an office "team building" trip. The staff were always there when you needed them and happy to help. I didn't try any of their food and alcohol is alcohol but the general atmosphere was great and considering how busy it was didnt feel too crowded. A fun night out with the team playing ping pong or table tennis, whatever works for you. 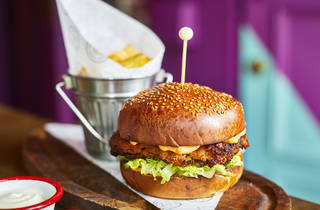 This trendy joint with its Dj spinning tunes whilst you dine on pizza or take in a cocktail or two is both welcoming and fun. 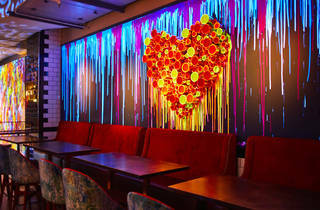 They offer reasonably priced food, some great pizza and drinks. Friendly attentive staff. The only downside is the drink prices. The bottles of wine in particular are rather pricey. Great place for team building or friendly socials. Bounce is great if you have a big group and are splitting a table or two. The price advisory should really be ££ pizzas around £14, cocktails £10 and a glass of wine averaging £6.50/7. 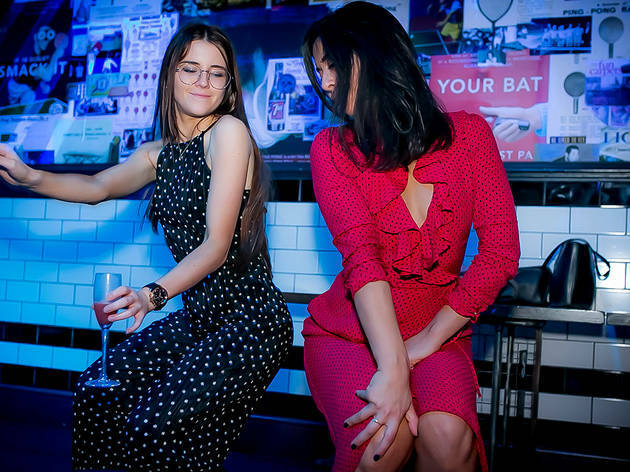 I went with a group of friends for a birthday recently and we were told that there would also be a dance floor area (for a Saturday night thats perfect right? Table tennis, drinks and some dancing all in one place). Sadly they decided it was too busy to take away two tables for the dance floor, meaning no dancing, as once we had finished the hour on our table we were asked to move out the way. This area doesn't really have much going without you travelling on a Saturday night so if you want to go out after make sure you plan ahead! 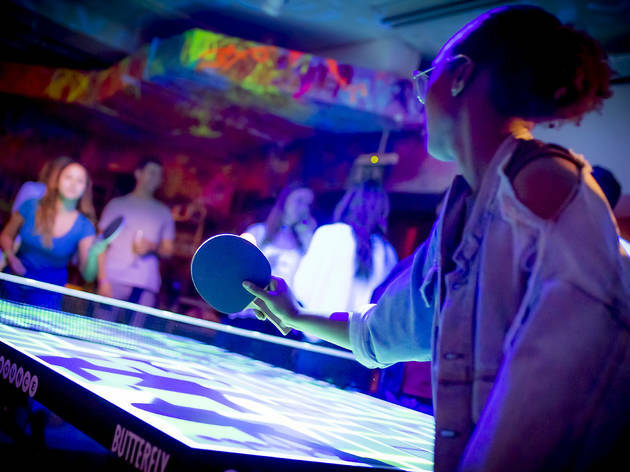 This is your classic after work social: playing ping pong under neon nights while the rest of your colleagues gyrate round the tables to an early 00’s playlist. They have a private room you can also book, we used this for a staff party - the space is big with 3 tables but the food wasn't anything to write home about. I remember when I first came to London and heard about Bounce - ping pong and pizza?! I mean, how could you go wrong? Its a great venue to get a big group of people together and get some friendly competition going. It’s basically a great alternative to the team bonding bowling activity. They also crank up the music as the evening goes on so you can boogie down under those funky black lights. Oh, and most importantly, they free pour - so let the games begin. Tip: Do try and get a table closer to the kitchen if you’re eating as it’s away from the ping pong tables and a little quieter so you don’t have to shout across the table, or get ping pong balls on your pizza. 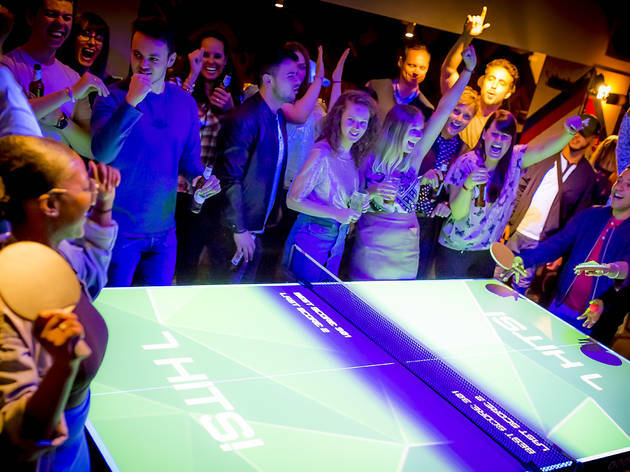 Also, if you can, try and choose the ping pong tables next to the DJ booth as you get a bit more room and don’t have traffic walking back and forth behind you when you’re trying to score that match point and (obviously) beat your date! I am clearly way behind in the London trends as last week was my first ever visit to Bounce.Having expected a rather small venue with 5-10 tables, I was amazed to walk into this underground playground with over 50 ping pong tables all full of people playing away.With a massive bar extending the length of the venue and extremely high ceilings, bounce is built for adults who want to escape the day to day grind.For me the real bonus was table service!You don’t have to miss a minute of play going back and forward to the bar.Even after the games have finished, you can enjoy the venue as there are barely any people sitting down so you can always grab a seat.Please note, do not try and eat your dinner beside the tables, you will get several ping pong balls to your face and in your meal. I had always wanted to go to Bounce and a work social popped up so we booked this. We had 8 of us and booked a table for an hour. I was surprised how big it was inside and actually great spaces for dinner, drinks and ping pong! The team there are really well organised and helpful. You get a little book of mini instructions so don't worry if you don't know the rules. Don't worry about losing your ping pong balls as they come round and mop up any loose balls running around with a nifty fishing net technique. We also chose to eat here in their restaurant, food is average prices but portions not massive unless you opt for a pizza. I opted for a chicken ceaser salad and it was actually really tasty, not sure how healthy but certainly tasty. It is great fun and I would actually like to go back for another visit soon, especially as my team lost! 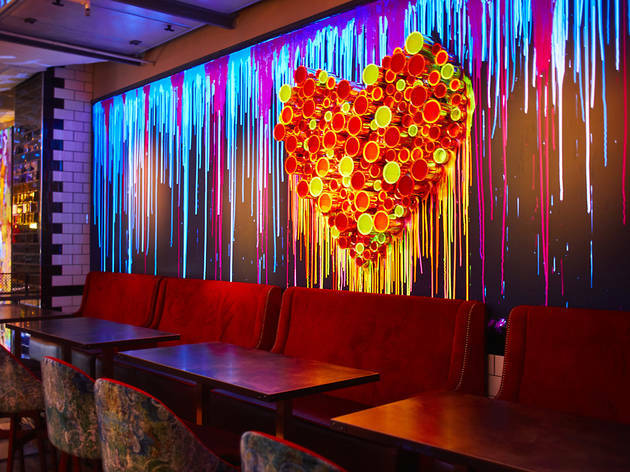 Fun spot for a group night out or a work social. My personal tip is not to book too many tables. If like me your ping pong skills aren't quite up to scratch the novelty will wear off. Having 6 people plus at a table works out well because everyone gets to play and have a break as well. They have a full bar and do good pizzas as well if you need sustenance! This place is insanely fun! I mean I don't particularly get a kick out of making a fool out of myself in front of other people but for some reason with ping pong it's kind of ok? The venue is incredible and spacious, there's a bar and a restaurant and it's nicely laid out. The prices are also manageable. We paid 30 quid for an hour and as we were six it was a fiver each. If you're here to play ping pong you will be happy. If you're here to eat and then play ping pong you might be a little more disappointed though. Perhaps we had bad luck with our server but when I asked him what the pizza bread entailed he went to ask a colleague and when he came back told me it was "like bread but pizza." I still ordered it because curiosity got the best of me (and I love goat's cheese) but it was basically a small pizza base (think personal pizza) without tomato sauce or cheese. It was still tasty (and at 6 pounds decently priced) but a bit disappointing to be offered so little information about something on their own menu. Furthermore, my friend ordered an apple cider and the server came back with a receipt and the card machine to charge her and then told her they didn't have apple cider. She (obviously) refused to pay and ordered a berry cider instead and then the server just never came back. Once we went up to the bar we were able to get our food and drinks so it was fine. It wasn't bad enough to taint the experience but a bit of a head-scratcher in terms of service. That said, if this was a one-time thing and the service is normally as good as the venue and the ping pong, then by all means come drink and eat here too. I have to say, it's pretty cool to go into a building and be greeted by a blue plaque telling you that ping pong was created on that very site. Really sets the tone for a fun-filled time, no? I went to Bounce with a group of peeps from work to celebrate a co-worker's birthday, and we had booked in advance. I was pumped to get my ping and my pong on. And so I did! I'm not great at it, but that didn't matter as all of us took turns cycling in on some two-on-two action. The rest of the time was spent admiring (and ordering from) the extensive gin menu - there is some emphasis on the gin palace aspect of the venue, which I liked. Cool vibe, too. Downsides: Had a bit of a time trying to sort out the birthday girl being overcharged for the booking. We also got a lot of stares from people who clearly take ping pong super seriously... the tables aren't separated by anything, so if you have any errant ball or five that get in someone else's way... just be prepared. It's hard to be totally enthusiastic about Bounce due to my incredible lack of hand eye co-ordination meaning i'm an absolute trainwreck at ping pong. 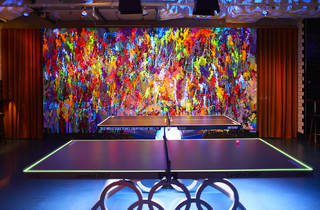 However, Bounce is way more than just a ping pong hall. It's got a great bar and plenty of space and booths to sit and chat if you're not assigned to a table or currently playing. I went with work and I would definitely say its more of a corporate vibe (well let's call it work parties for fun start ups and young agencies rather than a place to hang out with your friends) - but perhaps that just me. But its definitely a great place for a team night out! These guys always aim to impress and manage to do so with style! I love this place. This place is absolutely MASSIVE! Really well laid out, loads of booths near the ping pong tables so you can put your stuff down and order some drinks whilst you’re playing. Brilliant music and a really good bar area for after you’ve finished playing. 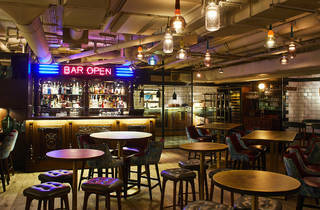 A super fun place to go for a night out with a group of friends, or for a relaxed date. I had heard great things about this place and I love places offer something a bit different and bring something new to the table (no pun intended), so was happy to give this place a go. We came on a double date, so there was 4 of us – but the other couple were set up, like a blind date, and this setting was ideal combination of sit down talking and fun activity. So firstly we got here for 6:30pm and sat in the restaurant area over the back of the main ping pong bar area. We asked our waiter when there would be a ping pong table available for us he said 9pm. 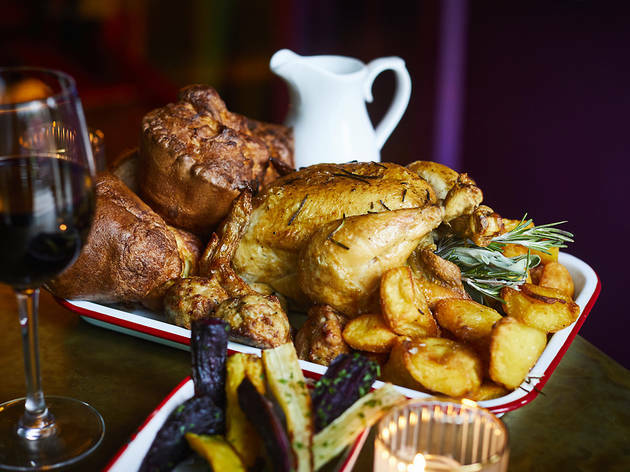 We thought this sounded a bit long but agreed to it nevertheless, as we’d gone there specifically over anywhere else with the intention of a promise of a game after dinner, so thought it was worth the wait. Just a note, you cannot prebook for groups less than 6 people but they keep a number of tables unreserved for walk-ins, though it does get very busy – it was only a Tuesday when we were there! Waiters were attentive in getting us drinks and service was good for our food. I had the “Posh Hawaiian” pizza which had ham hock, caramelised pineapple & fresh chilli so was a welcome twist on of my favourite standard toppings. As we had time we also then had desserts, I had warm salted caramel chocolate brownie with vanilla ice cream which wasn’t the best I’ve had, it was a little underwhelming, but nice enough. One thing I thought was a bit strange was the location of the toilets, they literally couldn’t have been any further away from where we were sat, I had to walk from the restaurant past the bar whilst dodging balls flying all over the place from surrounding tables back over to where we had entered the building – unless there were some closer I missed, this just seemed a bit unnecessary. Then before we knew it, it was 9pm so we were shown to our ping pong table. We opted for an hour on this which was a good idea, as we haven’t played for years it took us a while to get into the swing of things. There were only 2 bats, but obtained some more easily enough. You’re also allocated 2 small buckets of balls, but don’t worry you’re not got to be too responsible for these, they do end up all over the place and they have people there to collect them and restock your buckets. The atmosphere was really enjoyable, didn’t seem like people were taking things too seriously – well we certainly weren’t at least! They priced everything up on a tab which we paid at the end, it came to just over £35 each which is on the pricey side but also given the location and the novelty factor I thought it was okay for the food, drinks and overall experience – wouldn’t be something I’d do on a weekly basis, but as a kind of one off I didn’t begrudge paying it. At Bounce, the place be bouncing - okay, excuse the terrible pun, but Bounce really is a fun night out! Been twice now and both times really enjoyed the experience. Instead of just going to the pub for after-work drinks (which, of course, I love), it was different to go and play some ping-pong with friends. An entertaining and some-what mildly active way to unwind after a day at the office. Plus they had Blue Moon ON TAP, which for this Californian-born gal, is something I rarely get to come by. Drinks weren't overly pricey for location (central London) and the pizzas we got were pretty good as well. Nothing spectacular with the food, but the main focus is the ping-pong & beer. The only downside is at times the place is very, very loud and it's quite difficult to hear. Otherwise, a fantastic Friday night out! 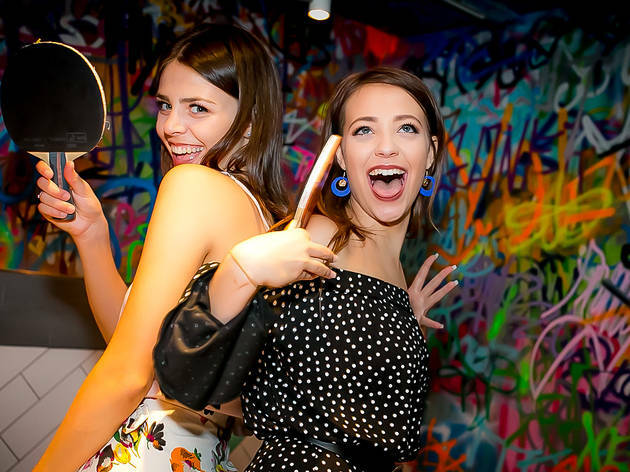 I had heard about Bounce many times: all of my friends were mentioning big venues where you could play ping pong for way too much money but ended up having lots of fun. I went to Bounce Farringdon for the 90s party they held on Easter Sunday. Due to its peculiar date, I assumed the place would be empty. WRONG! After being handed a plaited flashy friendship/luck bracelet, I entered a room full of people by the time I got there, around 9.30pm. The venue is huge and filled with about ten ping pong tables that people were queuing at while having a drink. For this specific night, you didn't have to pay to play which was pretty damn good. I'm quite bad at ping pong but people were happy bending the rules and playing according to my abilities which I found very friendly. I was worried it would be world champion after world champion taking it seriously but it wasn't the case. The only negative comment I'd make about the night is that the music wasn't great. I was there for S Club 7 and Nirvana that I just didn't get. Finally, they also have a restaurant part and serve loads of cocktails that I'm afraid I didn't try. If you're interested in organising an event there, you should know that they have a private hire room that looks pretty neat. We went to the 90's party. It was very cool, we've never been to Bounce before so we didn't really know what to expect. We don't really play ping pong so that didn't appeal to us as much, though we did enjoy watching other people play (quite entertaining). Drinks felt a bit pricey, we both got different draft beers that tasted quite watery, which was disappointing. Went here for a 90's party edition. We had the famous ping pong tables but also Nitendo 64 games like Mario Kart and several others. In the TVs you could see several clicks for famous 90s shows like Gladiators, the original TMNT films, Tamagotchis and etc. All combined with 90s music. Great night, had loads of fun! 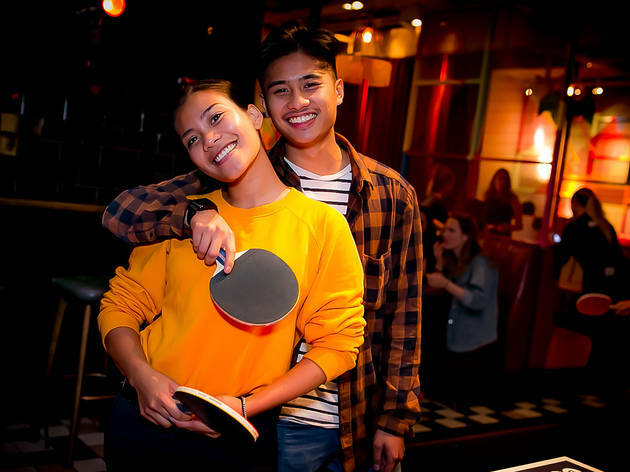 Myself and my friends had a great time playing ping pong, and the energetic atmosphere contributed to the overall vibe of the night. You should definitely make sure you book ahead if you are planning on playing ping pong, because you are unlikely to get a table if you show up anytime after 7pm. Ping pong is a little on the pricey side, and it takes forever to get a drink from the bar, but ultimately it's a great spot to have some easy fun and some good food. Normally I wouldn’t opt to play ping pong purely because I’d feel bad about embarrassing my friends to onlookers with how terrible I am. But unfortunately, I had to go for a work event and teamed with 8 other colleagues, we commandeered 2 tables for a couple of hours and displayed our ping ponging prowess! Thankfully, I was paired with someone rather good so just stood there most of the time. Although, when I did hit it, it struck some poor unassuming bystanders! Despite my lack of table tennis skills, Bounce is a pretty cool place, lots of space to play and provides food & alcohol. The staff were pleasant and you were never short of balls, I’d go back for drinks and to spectate rather than play! Maybe if we were allowed to play beer pong? Really fun venue that has remained busy since opening, I think it draws a bit of a birthday-party-office-bonding crowd so can be a bit daunting in a smaller group but in the quieter times its well worth the visit. We visited on a Saturday night and the ping pong tables were busy but well manages, the booths were hard to get if you wanted to stay for rinks but we managed to squeeze in, really glad we did because the gin selection was absolutley perfect. Really vast selection of rare gins and well made cocktails to boot. It's pricey but high quality- a nice surprise for a sporty kind of venue! The pizza restaurant out back is relatively good too, so its easy to make an evening of it here. I also love the building- its huge, hidden away underground and beautifully kit out with old tiles- if you like that kind of thing! 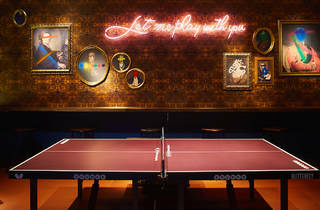 Sport and alcohol- an iconic partnership and one which is celebrated at Holborn’s Bounce- the ping pong bar. There isn’t a huge amount to say about this venue apart from the fact it is awesome. For as little as £5per hour, you can reserve a table tennis table and pretend you’re a pro while drinks are brought to your table and your ball bucket is continually refilled by the friendly staff. If you are quite nifty with a paddle or struggle to get it over the net, it really doesn’t matter. 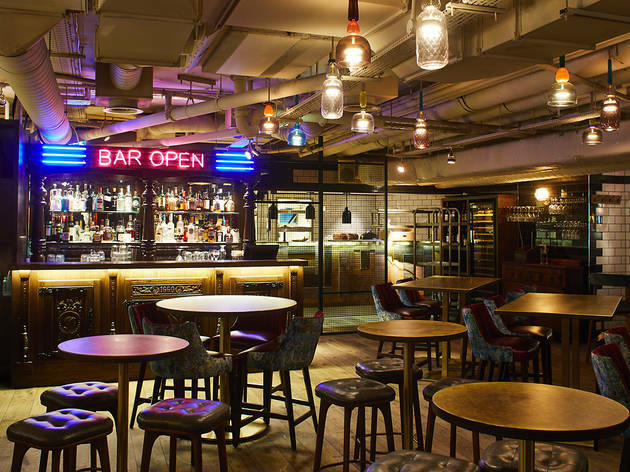 This bar is tons of fun and even if you have to wait for your table, the atmosphere is electric that you don’t mind the overpriced drinks menu. 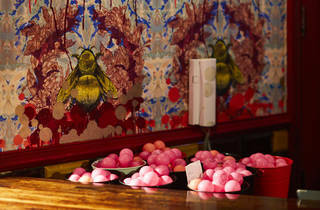 Bounce also hold a variety of special nights and events which have always been a hoot. Their Anti-Valentine’s day party is great for those who wanted to escape the hearts and doves and have drinks with friends. Their UV nights are also a spectacle; the lights go down and everything is aglow. Be warned, your competitive side may turn nasty especially when fuelled with beer, but this spot is a winner. I didn't really understand the draw of Bounce until I went there and experienced it myself. I've been there for work nights out and also for birthdays. Tread carefully, your inner competitive streak may come out more as the drinks flow! Overall though, a brilliant atmosphere, good food & drinks and depending on the time you are there a UV party to blame your poor ping pong skills on. I went there recently for a work do where we had booked 2 tables for an hour. There were about 15 of us, taking turns on the 2 tables and there were plenty of ping pong balls around so you didn't have to go hunting around for them. You get a decent amount of space to play, but we found that a few people would stand by the nearby tables, so getting in the way a bit. We stayed on after for drinks and ordered a couple of pizzas. The food was pretty expensive and there was not much choice. Overall, we had a good evening and would definitely go back there again. Love love my fav bar and the one in Shoreditch is fun to. Friendly staff, great mix of drinks, and added perk is the Ping pong itself. 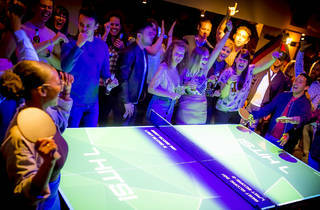 You can play on a table that was used in the London 2012 Olympics! What more endorsement does it need? This is a great alternative to sitting in the pub with your friends for an evening. Instead, you could find a ping pong ball floating in your beer. What's not to love? I love the smell of ping pong in the morning, why wouldn't I love Bounce! The venue is great i have never seen that before great service great food and amazing ambiance GREAT BOUNCE!!! 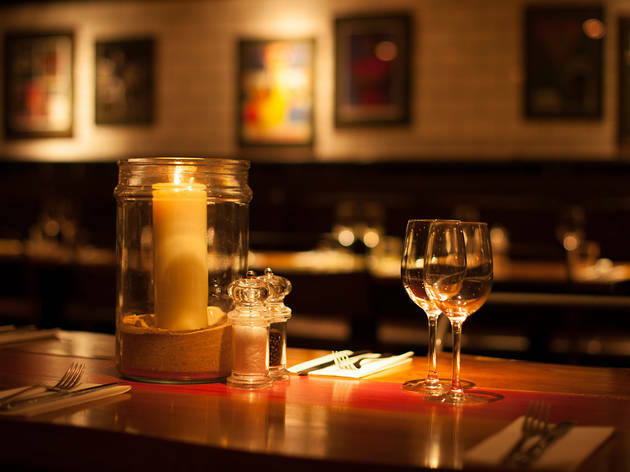 Fantastic place with amazing atmosphere, great food, perfect cocktails and good service. On top of that you can play ping pong. The best place to hang out with your friends and colleges. You can even bring the whole family if you would like. Had a brilliant time here on 17/10 as part of my birthday celebrations. There were 12 of us around 1 ping pong table for nearly 2 hors and we had the best time! The bar was buzzing with laughter, drinks were good and they even had the rugby on. Such a great place, we'll definitely be going back! I have visited Bounce on numerous occasions and I have never been let down! 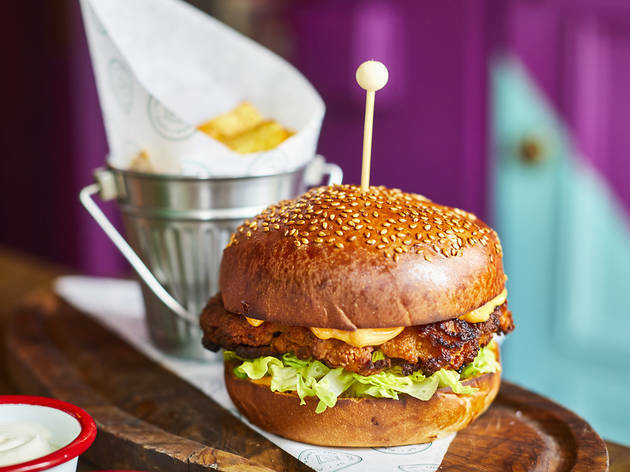 Friendly service and quality food and drinks. Actually a really fun place. Great to take friends to when they're visiting London. This is an example of a great idea that could have been executed much better! Admittedly, we visited on the Saturday night, which is probably the busiest time of the week, but it was just too noisy and crowded, too many people who had too much to drink, too much waiting around and too expensive drinks that the little fun we had could not justify. Bounce is great fun, i've been here a few times for work events. It's mostly occupied by large parties - usually groups of office workers in the area. As such, getting a table by just walking in is pretty much impossible. 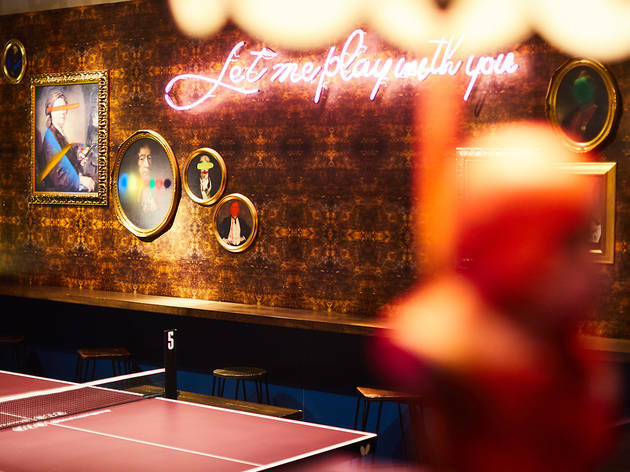 If you're looking to play some serious table tennis then this probably isn't the place for you but if you're looking for something a bit different to regular work drinks then you'll no doubt have a great time smashing a ping pong ball at your colleague's head! 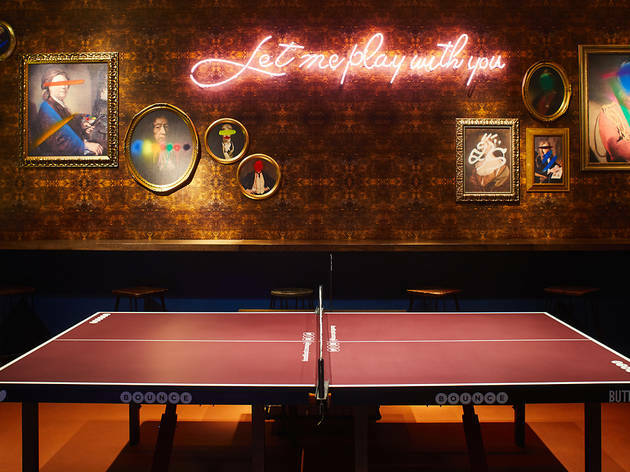 What's not to love about a bar with ping pong and pints?! 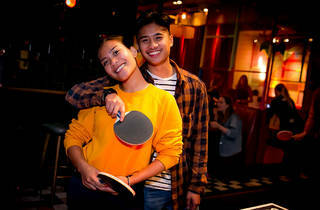 Hidden underground in Holborn, Bounce is a great concept and a very popular venue for groups of friends wanting a bit of friendly rivalry and competition. You'd be surprised how much table tennis you can fit into an hour or two and afterwards, the drinks are reasonable enough that you're happy to stay for a few. It can get really REALLY busy and unless you book a table well in advance, you can expect to be waiting up to an hour sometimes for a table but I guess that is testament to how popular it is. It has swamped quite a few imitators, but most don't match up and Bounce is still the gold standard for this kind of bar. Went to Bounce on Saturday night for a joint birthday and it was amazing. Great atmosphere. The party hosts were excellent and kept a large group interested and entertained. I'm telling anyone who will listen to try this place and can't wait to go back.